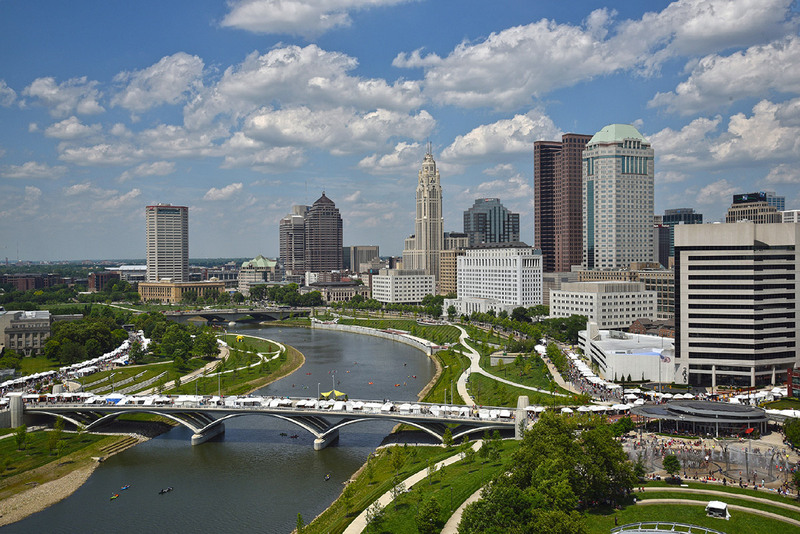 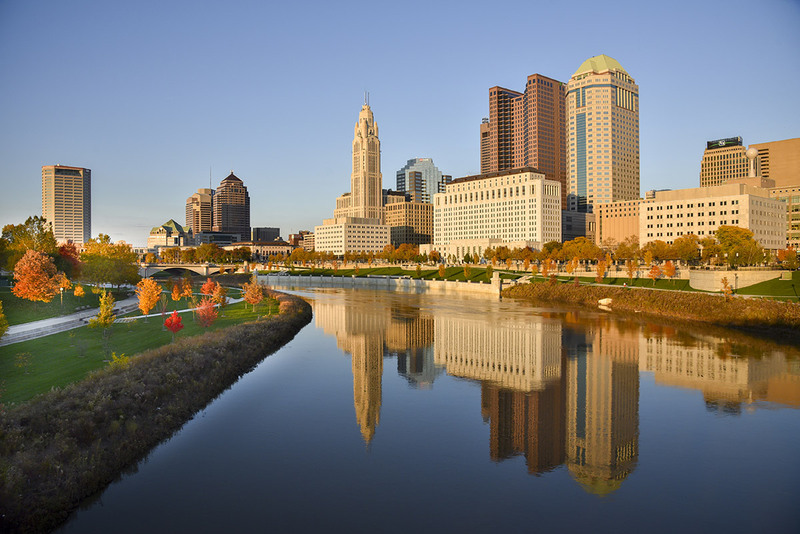 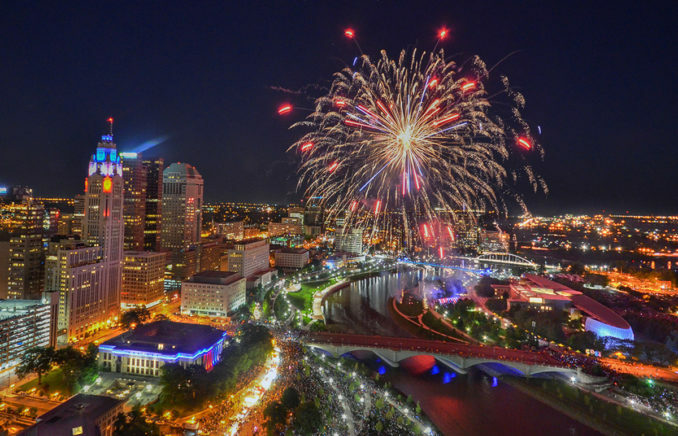 Columbus was founded on a bluff overlooking a bend in the Scioto River. In the last century, low-head dams were installed to prevent flooding to the west. 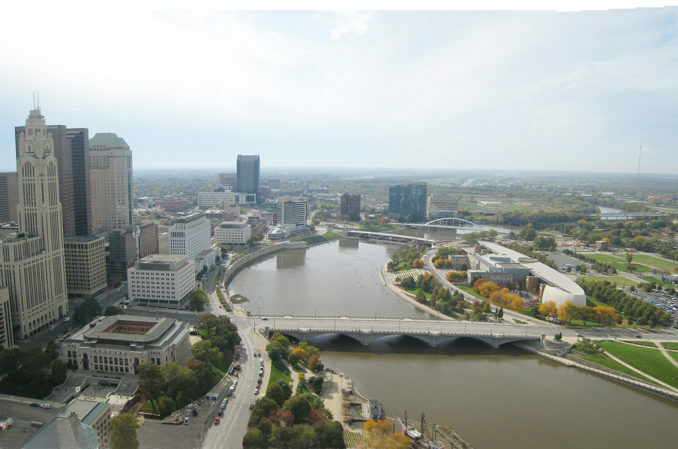 These dams pooled the river through downtown, causing damage to wildlife and restricting the use of the river itself. Since 1998, we have been advancing a comprehensive vision to reclaim the river as an environmental, recreational, and economic asset. 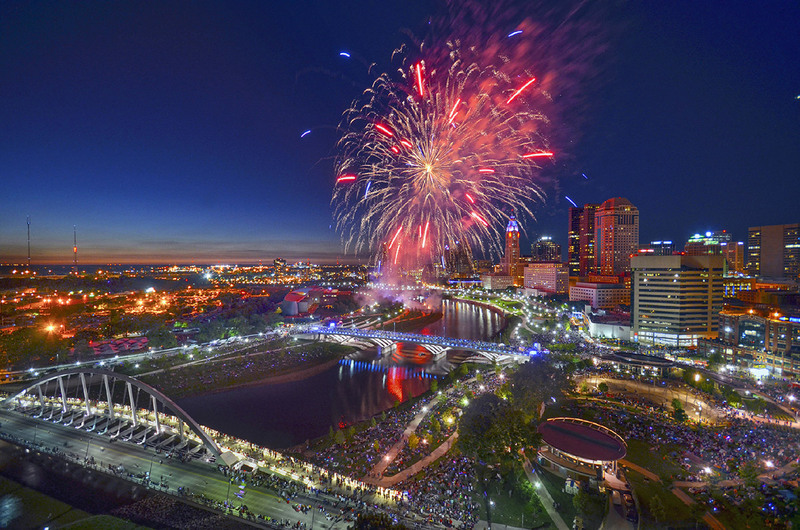 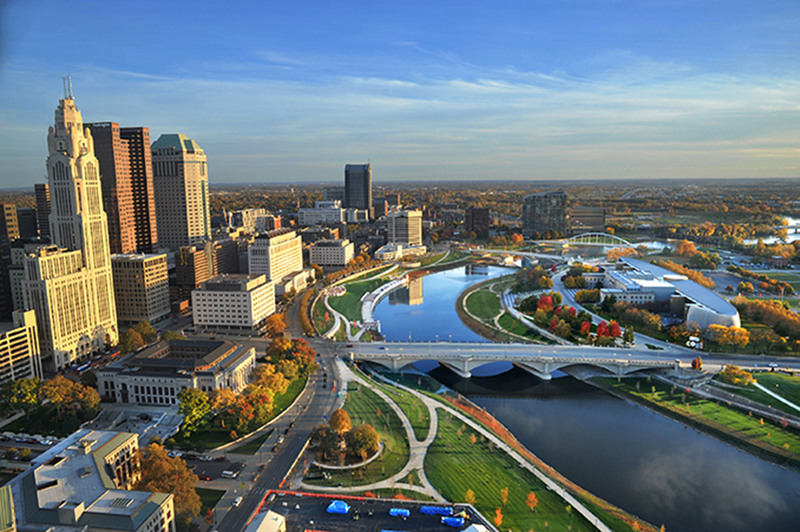 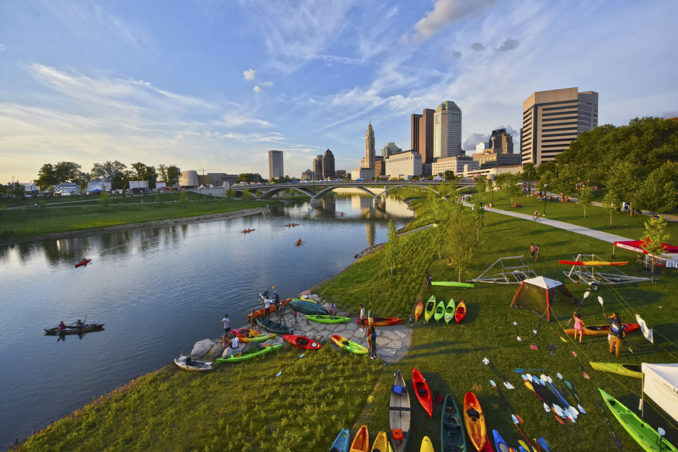 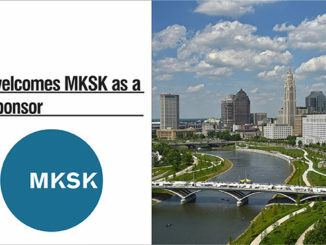 Genoa Park (1999), North Bank Park (2005), Scioto Audubon Metro Park (2009), and the Scioto Mile and Bicentennial Park (2011) were all catalytic open-space projects along the river’s path. 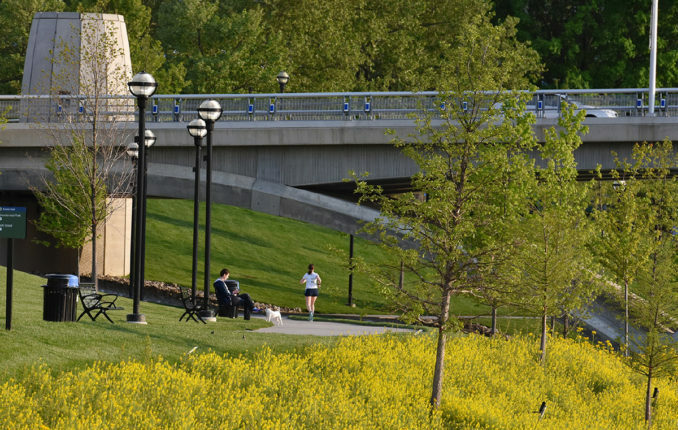 In addition to the parks, we also contributed to the planning and design of two new bridges that improved east-west connections across the river. 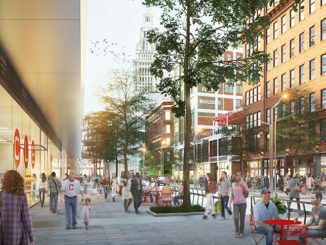 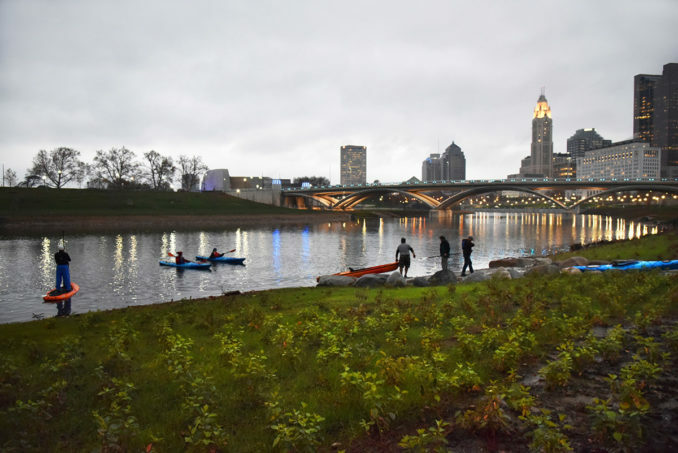 Still, the river itself was not fully accessible, healthy, or connected to these other improvements or to downtown to the east or the neighborhoods to the west. 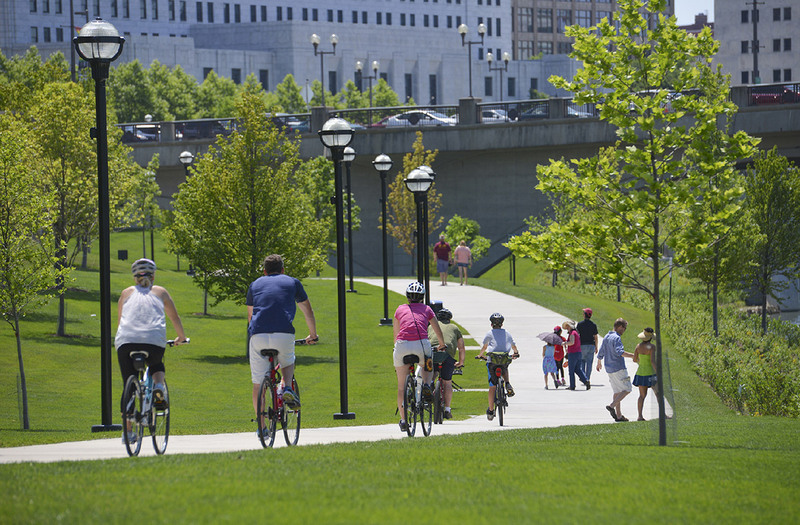 Enter the Scioto Greenways, championed by the Columbus Downtown Development Corporation (CDDC) and City of Columbus. 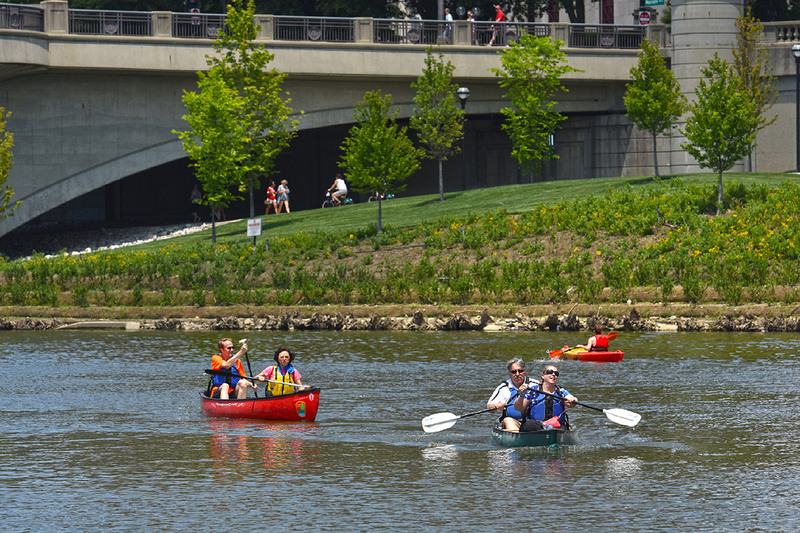 First visioned by the community as part of the 2010 Downtown Strategic Plan, a top priority was the removal of the low-head dams – a change that would restore the natural river channel, improving the aquatic habitat and water quality and increasing the diversity of native fish and mussel species. 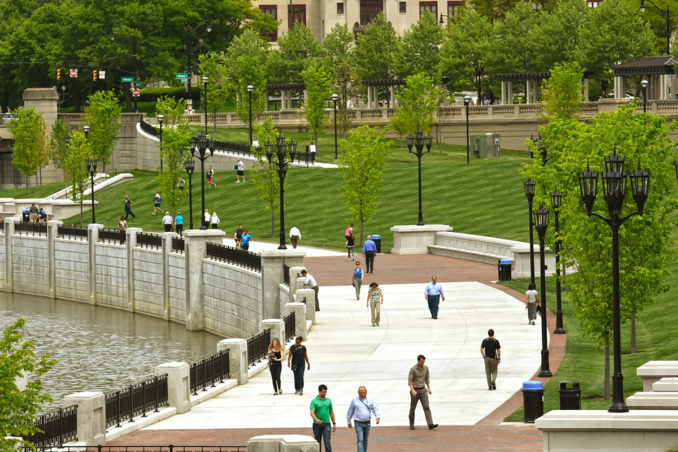 The project began in the fall of 2013 with the removal of the Main Street Dam. 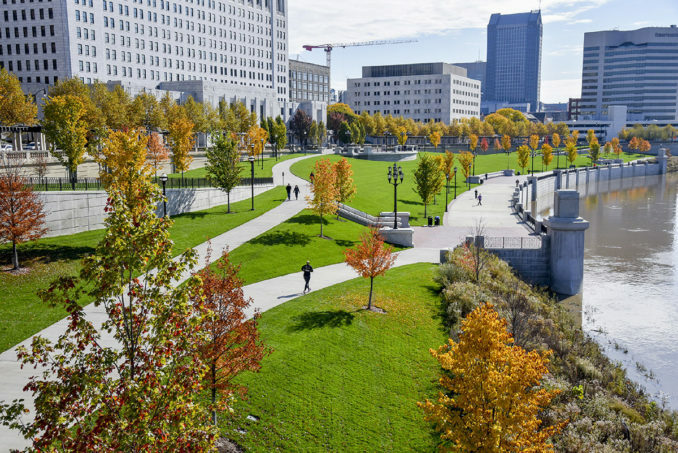 The lower water level and narrower river channel exposed 34-acres of previously submerged land prime for redevelopment as new parkland. 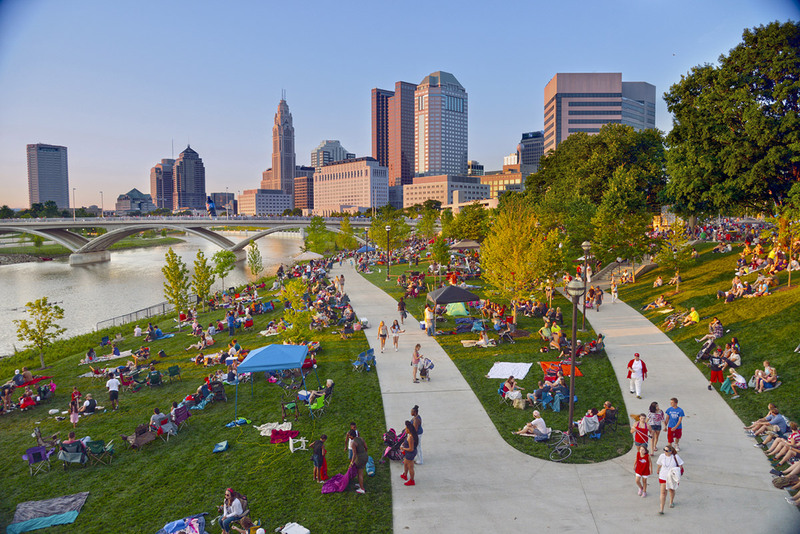 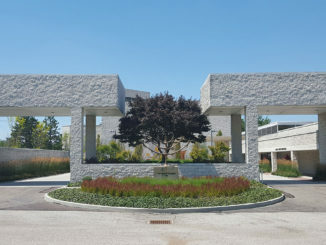 A central Promenade anchors the Greenways at the apex of the river-bend; 1.5 miles of shared-use trails connect the catalytic projects to each other and to a 60-mile trail network that connects five municipalities across Central Ohio; four new boat launches provide recreational access; a riparian edge defines the river channel and is resilient to fluctuations in water level throughout the year. 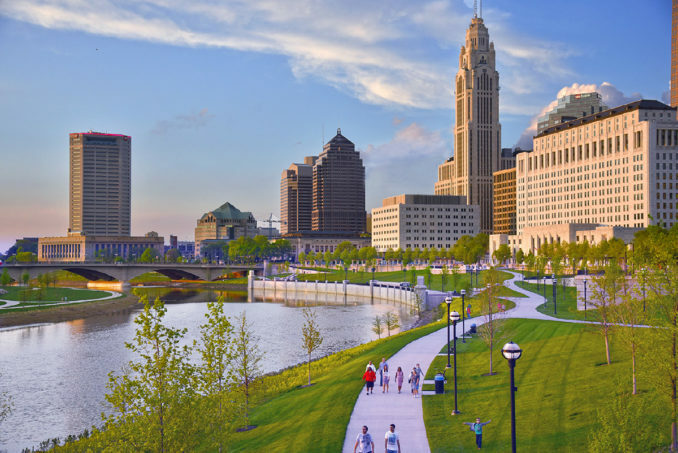 The Scioto Greenways is the latest, but not the last, piece of a puzzle that is repairing the river ecosystem and spurring economic development – over $2 billion in public and private investment so far over the past two decades.